I had always planned apply to college some day, and that day was finally here. I was finishing up my first application. My hands began to shake as I moved the mouse over the words, “submit now” as I realized, this was it — my top choice. Once my finger tapped down, there was no turning back. Click. It was sent through cyber space and into the hands of a stranger. A stranger that would decide my fate. It’s a strange reality when a parent can no longer fix a problem or make an important decision about their child’s life. I was feeling that reality and so were my parents. I felt both hopeful and helpless and so were they. My parents could guide me through the application and interviews, but ultimately the college will decide if I am worthy of acceptance. As this reality registered, my anxiety increased and so did the desire to go to that particular school … and only that school. They say you need to feel comfortable when you visit the college campus and picture yourself going there. Well, I did. I began my obsession with Marist College the first time I visited there. It was foolish, but I didn’t even apply anywhere else. I did visit many other schools, but Marist seemed the perfect college for me. One or two weeks before the decision letters were due, I began checking the mailbox on a daily basis. I would slowly open the mailbox — nervous, excited, and hopeful, and with a pang of doubt. I had prepared for this, studied hard, worked to boost my GPA and denied myself many nights out with friends working on the application and essay. Marist was for me, but did Marist know I was meant for them? Armed with a resume and portfolio I head to the college with my parents to meet with a member of the admissions department and the dean of the department I want to pursue. I leave both meetings feeling good but also knowing I’ve written it all, said it all and have nothing left with which to showcase myself. I’m pretty sure the mail carrier feels I’m stalking him. One afternoon nearing the deadline — in which I was told I would hear from the admissions department — I cautiously pull a thin envelope from my dream college from the pile of mail. 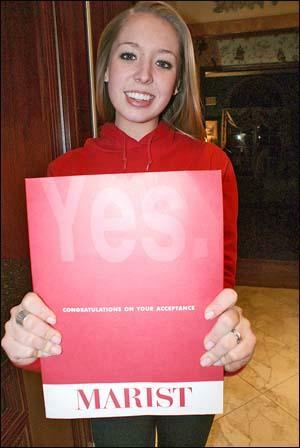 The rumor is that acceptance letters are large, with big bold happy words of congratulations stamped all over them. These large envelopes contain all the information you need to move forward in the process. But this letter was small. It looked meaningless and felt lifeless. Denial letters have no need to be full of information. It takes very little paper and space to crush a high school senior’s college dream. With shaky, sweaty hands and tears in my eyes, I handed my mother the envelope. Looking at it, she too thought the worst and offered her condolences and a hug. Like tearing a band-aid off when I was little, my mother ripped open the letter. It said: “Thank you for your interest in Marist College.” Phew. I was not being rejected from my number one school, only being thanked for showing interest. Hadn’t they received my application already? How long could it take to realize what I already knew — that Marist was perfect for me? Days and weeks went by and I continued to check the mail box. As the deadline came and went my anxiety increased. One morning, close to the holidays I woke up and baked gingerbread cookies, painstakingly decorating each one with separate outfits and original faces. I continued non-stop baking until 10 p.m. that night. At 6 p.m. my mother had suggested I go out with friends but I stayed home focused on my cookies. Where is this letter? Not only was I stressed, but my parents were as well. My father began to leave work every afternoon hoping to flag down the mail truck. My mom made a point of being home when I came from school. She stared out the window, waiting for the mail truck to pull up. They were both hoping to see the envelope before me. If it was large, they planned to leave it in the mailbox, if it was small, they would bring it inside and be there for me when it was opened. Hope lingers in the air. One day I got a call from the admissions person I met with. He apologized for the delay but stated they were behind in reviewing applications and sending out letters. I thought for sure this was a good sign. I was now confident I’d get my acceptance letter soon. To my dismay nothing ever arrived, January 1, 2011 came and went — a new year had started and early action applications deadlines for other schools were approaching. I called. I was assured a letter had been mailed. Another week passed … six official, legal postal delivery days. Nothing. I was starting to feel the agony of defeat and also stupidity. Why would I put all my eggs in one basket … on one campus? I should have sent my application to 100 colleges. I had no interest in 100 other colleges. I fell in love with just one. My parents began the stroking process: “You’ve done everything you could do and we are proud of you,” speeches and pep talks. And I knew it was true. There wasn’t any more studying, or tests to ace, or essays to write, or words to say to increase my chances of acceptance. However, I wasn’t sure what was worse, being denied, and rejected or being ignored and forgotten about, like it seemed I had been – receiving no letter at all. On the day I decided it was time to move on, to get back out there and continue my college search I arrived home to find my entire family huddled together in the kitchen. It was strange. They smiled and greeted me as if they hadn’t seen me in years. As if parting the red sea, they all separated and directed my attention to a huge white envelope propped up on the counter. In my hands I held a dirty, folded, bent, ripped and taped-together envelope. I tore it open. I was actually heading to college in the fall! They want me … they really really want me … me. Stress was the accessory I wore for almost two months waiting for that letter. Although at times I felt defeated by it, I wouldn’t change anything about the experience. They say the good things in life are worth waiting for. And this letter was one of those things worth the wait. Throughout the process my parents’ support gave me the confidence to accept whatever sized letter I received and to know that there was a college out there for me somewhere. My guidance counselor had offered his own words of comfort by telling me the college was saving the best for last. I checked for that letter every day for roughly six weeks, growing more and more inpatient by the day. Yet, at the same time I was forced to be patient, to surrender to the discomfort. My letter arrived three weeks after the date it was scheduled to arrive. Given its tattered condition upon arrival it was obvious it had taken a less-than-efficient journey. Those were the longest weeks of my life. As for those crazy gingerbread men I created while in my semi-catatonic, basket-weaving, institutionalized state of mind? Many, I ate. But many others were too decorative, looking more appropriate for a fashion show and I couldn’t bear to see them eaten. My mother decided this particular batch of gingermen were too labor-intense for human consumption. She varnished them and made them into Christmas tree ornaments … a symbolic reminder that patience and hard work pays off. March 21, 2011 in Fox Tales News. Just wanted to tell you your story brought tears to my eyes. My son Garrett was also accepted, but ED and didn’t have the horrible wait you endured. He did put “all his eggs in one basket,” like you, and knew Marist was for him the first time we visited. Awesome blog! 🙂 I’m going through similar feelings about my Marist decision right now. I should’ve gone for EA! Opening the mailbox everyday is so suspenseful! The college decision wait is as gruelling for parents who feel so powerless, often for the first time, unable to rescue their child from the feelings of failure and despair. Sounds like you benefitted from the wait. Good luck! As stressful as your wait was, it appears as if you gained much insight from the experience. That insight is immeasurable and will remain a part of you, branching off into other important life lessons we should all hope to gain along life’s path. My family especially enjoyed the fate of the gingermen, very symbolic. Great blog, we too had to wait extra long for a response from some colleges for my daughter and it was the most stressful time of her life to this date. My youngest is a junior this year and really wants to attend Marist so it’s good to hear when people talk so positive about the school. Us being from Southern California we want to make sure she’s happy being so far from home. My daughter is at showdow day today. Applying early decision. I am hopefully she will be accepted. It is her dream school and a perfect fit for her. Great story.